Seeing we had some frozen squid, I quickly ran it under cold tap water to start defrosting. 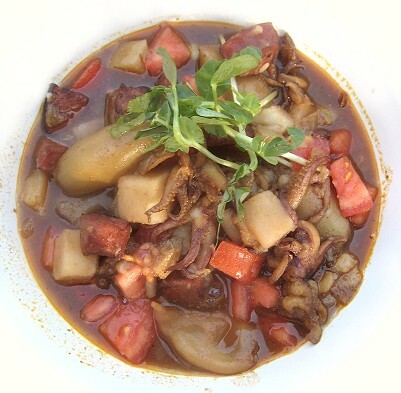 By the time I had sliced up all of the ingredients for this dish, the squid had already defrosted. You'd think I planned it all like that. 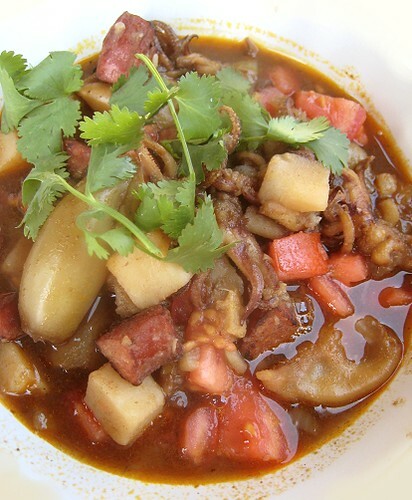 I was always curious about squid and potatoes together, so I wanted to do a dish with those two ingredients. I had a chorizo sausage left over from my chicken and chorizo paella so I diced it up and used it in this dish as well. This came together like any stew/braise. 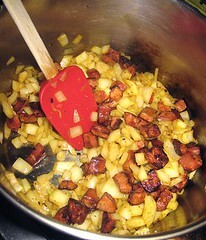 I started with the chorizo, then sautéed my aromatics in the rendered fat. I added the squid, then the red wine. After a bit, the potatoes and seasonings went in. Tomatoes finished the dish. For the spicing, I went with the combination of smoked paprika and cinnamon, which, for some reason, really, really works together. This wasn't spicy-hot, but there's a background heat from the smoked paprika that gave the dish good warmth. It would also be good with a more heat. I wasn't planning to use red wine at first, but it beckoned to me from its nearly empty container. The red wine gave the dish such a "rustic" and "old-fashioned" colour, which I didn't plan on really. As TS put it, this dish had a very "Old World" (Spanish, perhaps?) feel to it. This tasted absolutely wonderful. 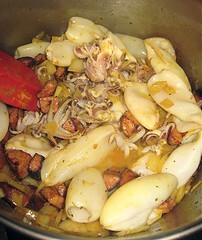 It was very satisfying and hearty, the squid juices melding nicely with the chorizo, the aromatics and the seasonings. While we ate it with rice, of course, a nice big hunk of bread would be the thing to have with this. In a pot, heat olive oil over medium heat. Add chorizo until it renders some of its fat. Add onions and garlic and cook for about 1 minutes. 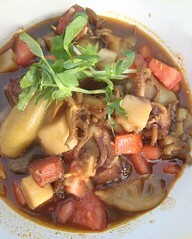 Add squid, then red wine (start with 1 cup; you may add more to cover the contents of the pot). Bring to a boil then lower heat. Cover and simmer for about 15 minutes. Add potatoes to the pot, followed by the smoked paprika and cinnamon. Cover once again and continue simmering until potatoes are cooked. Stir in the tomatoes and serve. Looks awesome, I can almost smell it looking at the pictures :) Quick question: what kind of red wine did you use for this? Did someone say chorizo?!?! YES! Anything with chorizo for me!! Beautiful recipe! I feel like I just took a trip to Spain and back. I'd probably prefer rice instead of bread to serve with this, but that's just me. Just saw your stuffed squid recipes, by the way. Will have to put those on The List, too. Thanks! We don't quite remember, but we're pretty sure it was a Merlot, just because that's the kind of red wine we seem to have lying around the house a lot. Hehe... yes, fatty pork in whatever incarnation is the way to go. But you have to put all your beautiful breads to use! ;D But yes, we do roll the rice way as well. Looking forward to seeing what will most likely be a more beautiful stuffed squid dish on your blog.